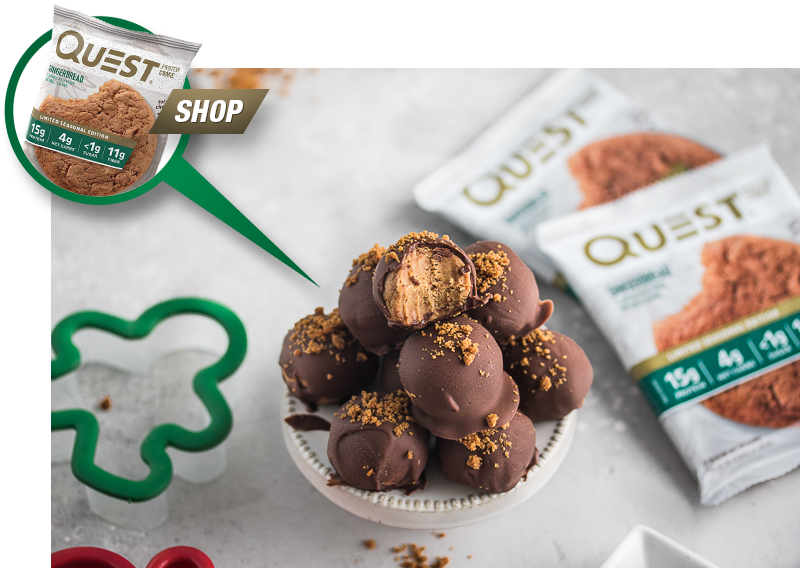 If you’ve been searching for a way to make your Quest Gingerbread Protein Cookies even more craveable, look no further than these super-simple, super-poppable gingerbread truffles. This is the perfect dessert recipe for anyone who doesn’t want to spend a bunch of time preparing — you’re set to start eating in 20-30 minutes, and most of that is freezer time. Get in the holiday spirit of laziness and curl up with this chocolate gift from the protein gods. Break Gingerbread cookies into pieces and place them into a food processor. Pulse until small crumbles form. Remove 2 tablespoons of crumbles and set aside for garnish. Add the cream cheese, milk and protein powder to the food processor and continue pulsing until combined. Separate the mixture into 12 evenly sized balls and place them on a baking sheet lined with parchment paper. Chill in the freezer for 15 minutes. While freezing, melt the chocolate in a microwave safe dish until smooth. After 15 minutes, remove balls from freezer and dip each ball into the chocolate and top with gingerbread cookie crumbles. Repeat until you have covered each ball. Return balls to the freezer to harden the chocolate before serving. Be sure to store leftovers in an airtight container in the refrigerator or a cool place to prevent melting.